Beautiful! Do you know, is there an identical 10" x 29"? This pennant may have been hung at a team function e.g. end of year banquet. Wherever it hung, it's cool. How did you get it? Great Pirates Banner. Do you mind if I ask how you display it? 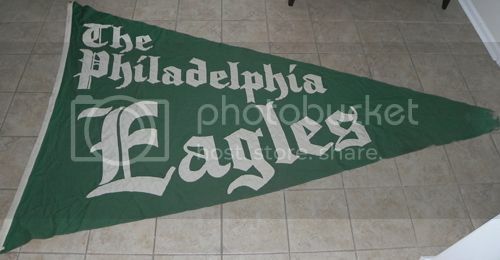 I have a huge Philadelphia Eagles banner that reportedly hung in Franklin Field that I have struggled to find a way to display. It is very large - approximately 9 feet long, by 6 feet wide at the left side. I hate the idea of using tacks or anything, especially since this is made of a pretty heavy canvas material, and I would worry about damaging/tearing it by hanging that way. I have spoken to a few framers, and they wouldn't touch it due to its size. My latest idea (although a bit ridiculous) is to have 2 large pieces of thin plexiglass made into a sort of giant screwdown case that I could hang on my wall. I have talked to a plexiglass supplier, and my plan was to have 2 large sheets made with screwholes along the edges that I could use to tighten the pieces together, thus sealing the flag inside. Sort of a ridiculous idea, but it might work. Anyway, here is the flag. That's an awesome Eagles pennant. I have the same problem with displaying mine. Ironically I have considered the same Plexiglas solution. Let me know if you actually attempt it. I have seen Plexiglas shadow boxes used by museums to display oversized tapestries and quilts. I have to believe that would be too cost prohibitive for my budget. I have three large Pirate banners the largest of which is ten foot by four foot. I have all three wrapped in linen around a large cardboard tube. I take them out on opening day and display them in my office for one week. I have an understanding boss and 16 foot ceiling that accommodates their size. All three of mine have grommets that make it easier to display them without risk of damage. I have my SF flag from Wrigley under plexiglas but your flags are much bigger. 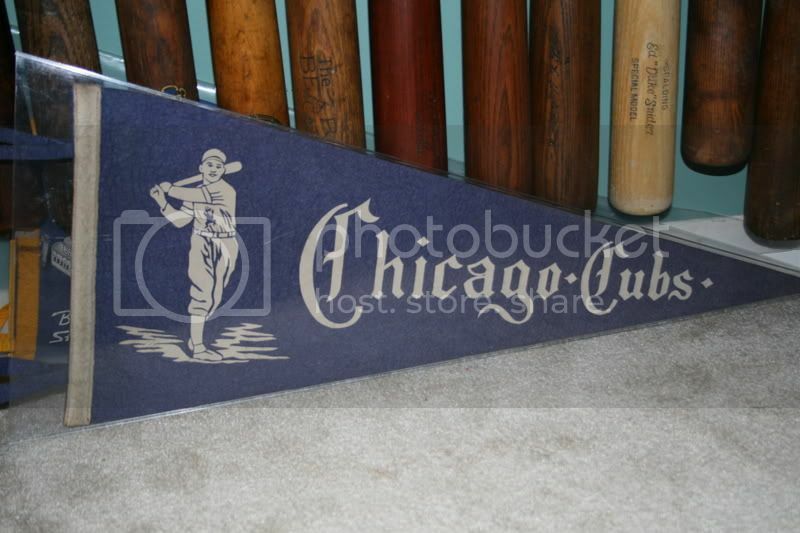 The Wrigley flag is "only" 3' x 6' and I got the plexi at a Sears hardware store. If you can get plexi big enough for your flags, I say do it! Thanks, I stumbled upon it on eBay. The union stamping is similar to that I have seen on the 1971 World Series celebration street banners. I have always hoped it might be related to my 71 Bucs. 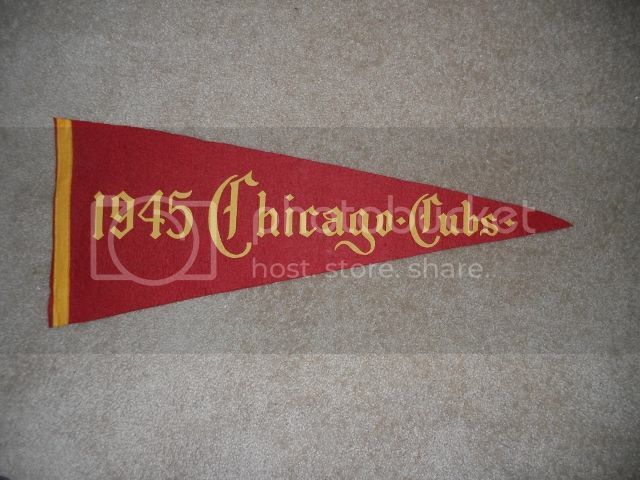 I found these on ebay...some similar, but not exact, standard sized pennants. Surely, old news to you. and the b&w picture is what made me think maybe your Pirates flag hung at at team function (that and the "weighted tip"). Is the 2nd from left guy checking his cell phone.....30 years before they were invented? Rob, thanks for info. I have a couple of those standard sized pennants as well. The photo you posted certainly gives me something to consider about the potential purpose of my oversized pennant. It also gives me something new to search for as well. By the way the guy texting looks like Ford Frick? Thanks again! Last edited by 71buc; 02-23-2014 at 02:26 PM. 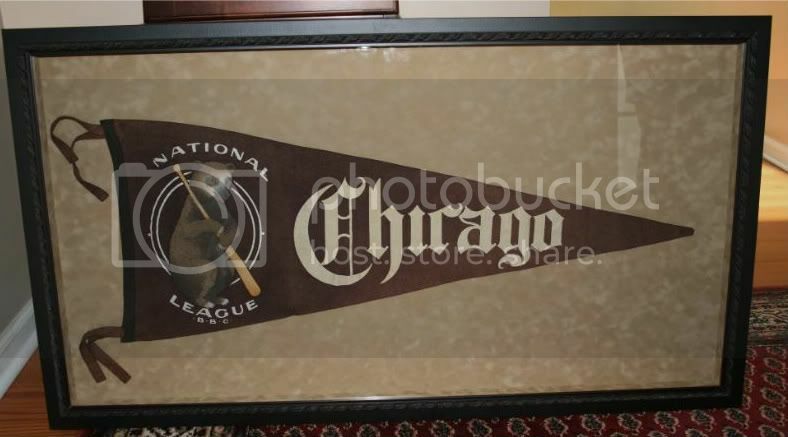 I'm not a pennant guy per se, but just picked up this photo in the RMY auction last night that I thought you guys might enjoy. It shows 1954 Cleveland Indians team officials taking inventory and getting World Series Souvenirs ready to sell at the ballpark, including. Hundreds of pennants including several with the stadium and others with the Chief Wahoo image as well as some New York Giants pennants poking out of a box too, not to mention yearbooks, stadium pins, visors and T-shirts. Fun stuff! Love seeing the merchandise! 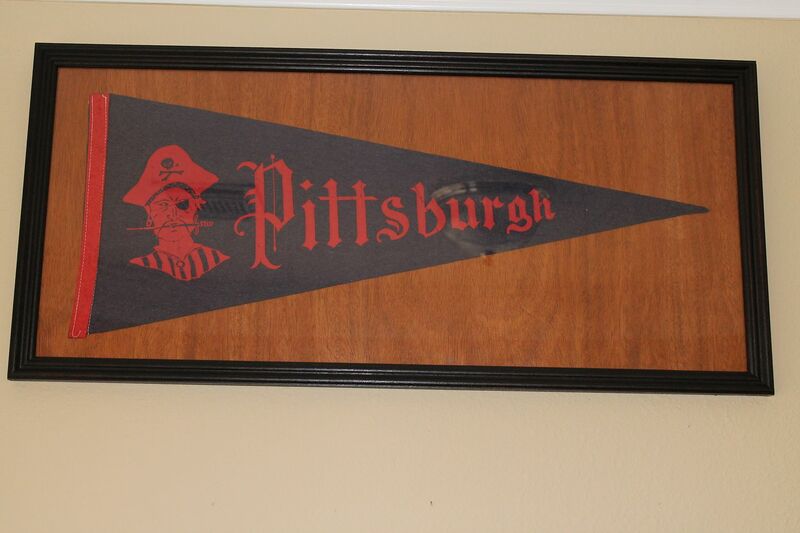 I wonder what those pennants went for back then? A buck? Great pennants! I thought I'd post this flag I picked up at Mark Macrae's St. Leanders show. It takes a huge space on my garage at 7.5' x 4.5'. Made by Hortie Van of Pasadena. It's double sided - I guess so that it read "left to right" no matter what way the wind took it. Rob, I may have asked you about this one already and I know it's a long-shot, but if anyone has ideas as to where it flew, please let me know. Thanks! I think your plexiglass idea is perfect. That's about the best you can do, and I think it would be a very attractive/protective solution (without damaging the Banner). Rob pulled it off nicely with his Giants Pennant, already. If you do go this route, please post "before and after" pics and let us know the cost. I have some over-sized stuff that might be good "candidates" for this as well. Last edited by perezfan; 02-23-2014 at 06:40 PM. Here are a couple of my favorites. The small pennant is from Luke Appling Day with the pin attached to it. Nice graphics on that Albany Pennant, Greg... really captures that era perfectly. Here are a few favorites from the teens... just to keep this thread going. 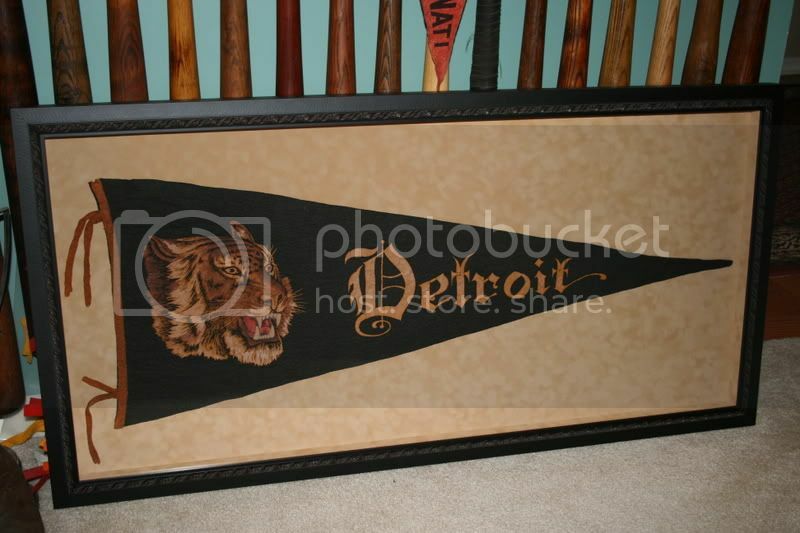 Those are really nice and I don't think most people have any idea how rare early over-sized pennants are. Especially in that condition. Even if you had the money to drop on a collection like that, good luck finding them in the next 10-20 years. 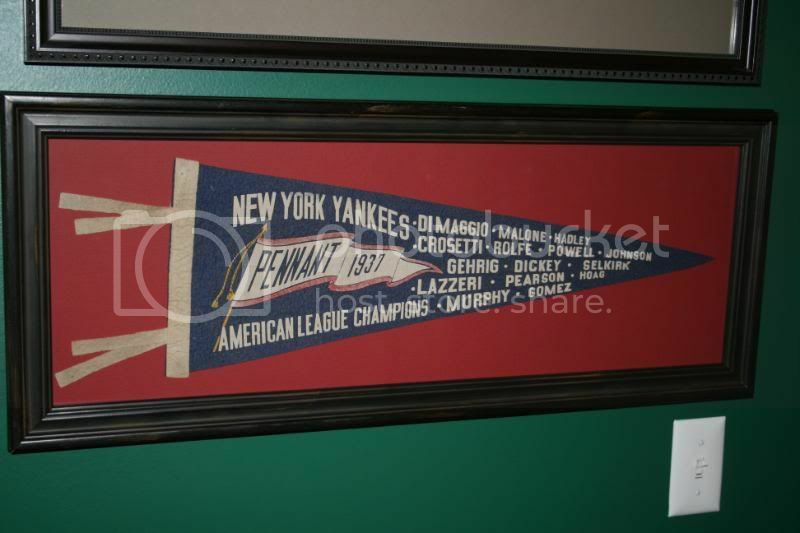 I buy and sell a fair amount of pennants and do collect Yankees pennants for my own collection, but even as a seller I have to say that is an incredible grouping of pennants some of which you may have the lone example. Thanks for sharing. Completely agree... Having watched these so closely over the years, I think it's safe to say that they're drying up pretty fast. I believe that most which surfaced over the past couple of decades are now safely tucked away in people's collections for a while. The new finds seem to be turning up at a slower rate than before. It still tends to go in "waves", but the waves are getting a lot smaller! 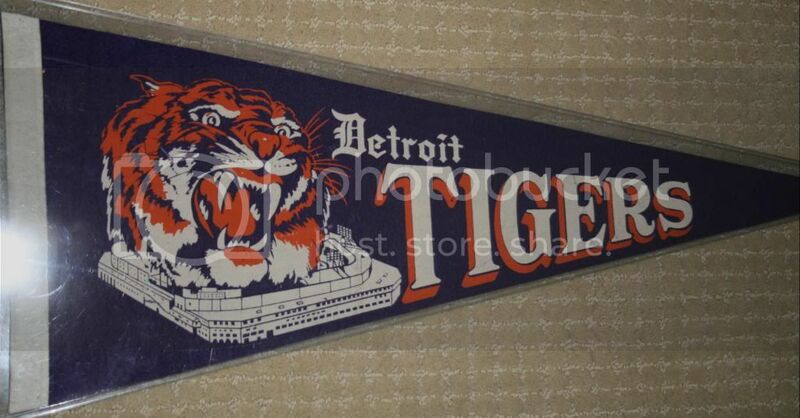 You hardly see a quality vintage pennant at auction anymore. You have better luck tripping across one on eBay than finding a solid one at auction with the usual suspects. Greg, absolutely love the Albany pennant. I know I've shown this one before, but it's one of my favorites. Here are a few of mine that I consider "scarce". The key word being I...LOL. Last edited by mjkm90; 02-24-2014 at 07:02 PM. i wish I had some info for you, but I don't. The seller had no story? your question lead to one of my own.....my Giants Wrigley flag is a white "San Francisco" on a purple background. 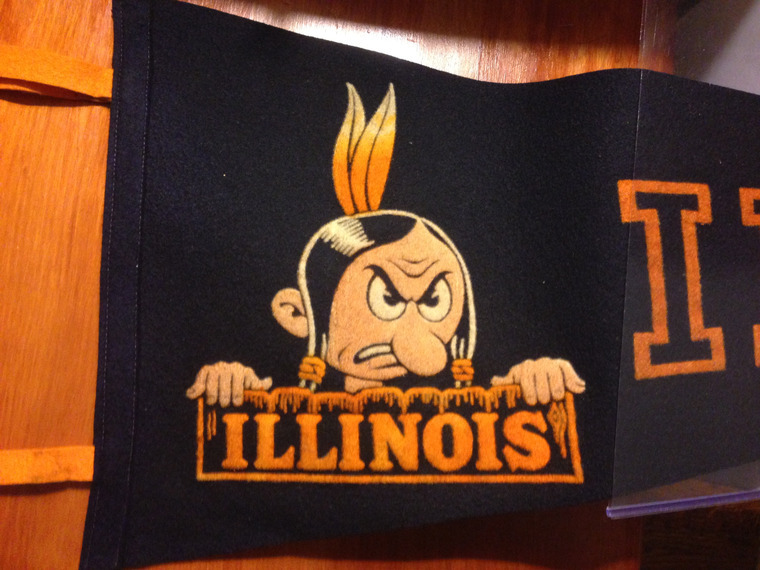 The current Wrigley flags are an orange "Giants" on a black background. I'm 99.9% sure mine is legit, but when did they make this change? really cool! I love the white picket fence! I totally agree....Mark's collection is amazing. I have rarely had a chance to buy even ONE oversized, early Giants pennant and when I have, the money has scared me off! Last edited by ooo-ribay; 02-24-2014 at 10:00 PM. Never seen that Giants variation... wow! I thought the Reds had a monopoly on that style (there are 2 other Reds variations, albeit not as rare as the one above). This was the Reds pennant that really reminded me of the next year's Giants. I think the Reds was recently in an ITPC auction. That's it. Definitely looks like the same manufacturer. Good catch! Mark and Mike -- so many beautiful pennants! And Mike H. -- right back at you -- I love that George Burns pennant. Here are a few more from me. Those can't be easy to find! Yeah, those are really unique... you never see them. Great stuff, Greg. A number of those must be one-of-a-kind. I've never seen any other examples of the Cub wearing the Cap, the oversized/framed Cubs, or the Tiger Head above the Stadium. Really great stuff! 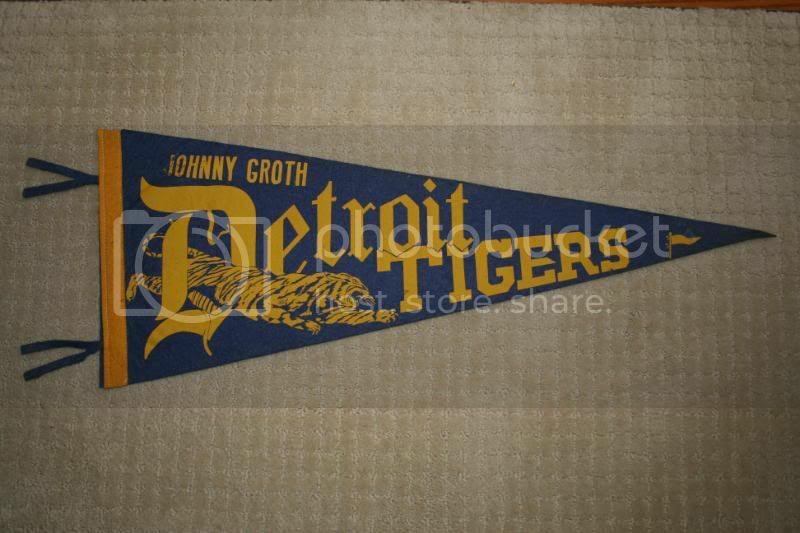 There was another Johnny Groth Pennant on ebay recently. Do you still have yours, or did it make it's way to the ""outside"? It is interesting, as we once thought it might be a "special" pennant, made just for him. Fascinating to ponder why they would mass-produce a pennant like that for such a common player? ^^^^^ The Hotel Havlin one? How big is that and what do you think the wedge shaped wood was for? Very cool. Hey Rob. That's actually a horn attached to the pennant. Ahhhhh......how big is the horn? Wow... blown away by those two, and have never seen either. Condition of both looks amazing as well. You see so much of the standard Reds stuff, that when something truly unique appears, you just have to marvel at it. It may not be the only "61 All Star Pennant, but sure is a toughie. I would bet you have the whitest one in existence. These damned white pennants are almost impossible in that condition. Last edited by perezfan; 02-25-2014 at 02:02 PM. Here are a few of my favorite college pennants. below is a little paper pennant. The R/A is Roos/Atkins, an SF men's clothing store. As early as 1958 they were supporting the Giants, originally as Roos Bros. and Atkins. 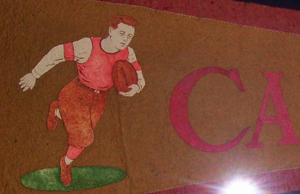 Sorry for the small photos, but here is my Carlisle pennant with Thorpe-esque football carrier pictured. This one isn't in my collection, but rather part of my for sale inventory; its a rare Stan Musial pennant. Keith: What year is the Stan Musial pennant from .. its a neat looking pennant. Mark is correct - the pennant has the date on the end, but tough to see in my small image. I believe on that date a statue of Musial was unveiled outside Busch Stadium, and this pennant was likely produced for that event. Cool thread, so many awesome pennants! Pre 1958 PCL pennants, with a few exceptions, are tough to find. Early PCL pennants fall into the "hen's teeth" category. Here's one of my favorites: 1914 Sacramento Wolves. The PCL Sacramento franchise was re-named after manager Harry Wolverton for the 1914 season, and became the Mission franchise later in the 1914 season. 21 year old future Black Sox player Lefty Williams was 13-20 with a 2.05 ERA for this not-so-great team. Man, that's a beauty... really love the colors and graphics. Last edited by perezfan; 02-28-2014 at 03:20 PM. I'm really happy to see new additions (without bumps from me)! ^^^^^ is that a PIRATES pennant? Wow!!!! I absolutely can't believe the colors on that one. Magnificent!